Queensland solar power has been shaken up a bit recently with the controversy over electricity prices and whether solar panel users should be charged an extra levy. This is despite the fact that solar has shown to reap great benefits for the state, which has the highest concentration of solar-panel powered households in the nation. Thankfully, this debate was resolved by the Queensland Competition Authority's (QCA) final determination, which ruled that renewable energy users shouldn’t face these extra charges. Queensland solar users collectively sighed a breath of relief at this news, despite the fact that recently even Queensland energy minister Mark McArdle came out saying that 'green' electricity schemes are driving up electricity prices. 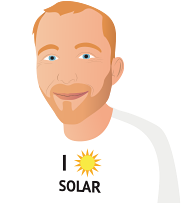 "The overly generous solar bonus scheme gave significant cash windfalls to those customers who installed solar PV on domestic roofs, but the scheme did not pass on the real costs to the electricity network, to support solar PV," said Mr McArdle. "It is not right that the 80 per cent of customers who do not have solar are expected to pay the full price of the 20 per cent who have solar." Mr McArdle also stated that it's important for Queenslanders to understand what is driving up the price of electricity,and that the state is looking at ways of reducing the impact of green schemes on household costs. However, Nigel Morris from Solar Business Services said that this information is distorted. Mr MrArdle stated "green schemes and the carbon price" are responsible for an 18.9 per cent increase in electricity prices, but Mr Morris says green schemes are actually accounting for just a 3.5 per cent increase in the average $1,900 bill. Morris' view is the one that was validated in the final decision. The QCA finally ruled that renewable energy sources are not a significant driver of rising electricity costs in the state. "Notified prices will increase in 2013-14 due to increases in the underlying costs of supply, which are predominately driven by increases in network charges," the QCA's final determination stated. "Energex’s network charges will increase by around 19 per cent (on average) and Ergon Energy’s network charges by around 17 per cent (on average). Energy costs are the next biggest cost driver and are estimated to increase by around 9 per cent.," the report stated.